The purpose of this article is to redefine depression as our psyche's response to disconnection from our souls and to help us use this response to cultivate and reconnect with our own inner light. Depression is a call from the soul to learn how to deal with the emotion of sadness. At the very core of sadness is the message that we are disconnected from our own soul. We have closed off our hearts to ourselves. To deal with sadness we must go within. Sadness is a very personal emotion. We think that events outside ourselves make us sad. But in reality, no one can make us sad but ourselves. To deal with depression requires embracing our feelings of sadness. We are sad because we are not experiencing the love that we came here to experience in the human form. We must find out why we are not experiencing love. We must learn how to open up our hearts and our psyche to universal love. We must train ourselves to embody this love. This is one of the basic reasons that we come to planet Earth-to learn how to release resistance to love and to fully allow this universal energy to flow through our being. Depression is one of the means to get our attention and to remind us of this basic human endeavor. Depression is initiated by the soul to oblige us to confront and resolve our inner conflicts that prevent us from experiencing universal love. The alchemy of the soul requires us to transform the energy of sadness into bliss. This is, of course, no easy or carefree process. It doesn't feel good and it takes patience and disciplined work. Welcome to Planet Earth! We are obliged to experience grief, sorrow, pessimism and loneliness. The trick is that we are not obliged to indulge in these feelings. They are there to teach us. But they are not there to torment us. The key to understanding all these feelings is the realization that they are a reflection of our separation from Source. They are a response to a closed heart. They are generated by a lack of self-love and a fundamental misunderstanding of who we really are. To understand our divine nature we must have the experience of our own soul. We will not love ourselves simply by having someone tell us we are beautiful and great. We have all witnessed how transitory the elation from even honest complements are. For the remedy cannot come from outside ourselves. The remedy is found within our own hearts. The problem is, of course, that our hearts are closed - blocked off by negative experiences, unexpressed emotions from traumas and bad programming. We must revisit these experiences, express these emotions and reinstall new programming in order to make our way back into the core of our soul where divine love resides. Depression is an invitation to this inner journey. Not the most popular journey, we often choose to avoid it with denial, blame, medication and outward preoccupations. But my observation is that like other soul lessons, some form of sadness and depression never really goes away until we find the gold of divine love in our own hearts. Actually we wouldn't want to be able to totally deny the painful messages and thus avoid the process that produces the alchemy. For we are here to experience love. The human journey ensures that we will be prodded to do what it takes to have this experience. Depression invites us to turn inward so that we can discover the cause and source of our pain and find resolution, freedom and empowerment. Although the basic cause of depression is disconnection from universal love, there are many human explanations that cause us to be depressed. They are all mechanisms to remind us of how we have shut off ourselves from our divine identity and effectively keep ourselves separate from Source. Some of the above are easy to identify. We know when don't like our job and feel abused in our relationships. However, other problems in our psyche lie outside our conscious awareness. The result is that we think our problem is our depression. However, depression is a symptom of a deeper problem that we can't consciously identify. Our inability to connect with our own self-love and experience our connection with the Divine is the most fundamental of these unidentifiable problems. And even if we identify it consciously, as we are now doing, we cannot access the connection and thus the solution through our conscious rational mind. The good news is that there is something that we can consciously do to cultivate this connection. Yoga and meditation were designed to cultivate the inner connection with our soul. Meditation is medication for the soul. In a very real way meditation is a medication because it changes the biochemistry of our body and brain. All life experiences are dependent upon our biochemistry. Human consciousness is biochemical. The human psyche is an expression of biochemistry. Biochemistry makes our different human experiences possible. The pivotal question thus becomes how can we impact and change our biochemistry? For as we change our biochemistry, we change how we feel. We change how we think. And we change how we perceive what we experience. It is very easy to monitor how we change our biochemistry. How do you feel after you have eaten sugar vs. had a balanced healthy meal? There are many ways to change our biochemistry. They include diet, physical activity and exposure to light. We can also change our biochemistry with nutritional supplements, herbs and chemical medication. The good news is that we do not have to become dependent upon chemical medication to deal with depression. The good news is that we can also change our biochemistry through yoga and meditation. Yogi Bhajan gave us Kundalini Yoga and specific meditations to change the biochemistry of our bodies and brains. These practices promote pleasurable states of being - joy and bliss. We feel happy for no apparent reason. This happens because the channels of the brain that connect us with higher states of experience and love are accessed and opened. As we practice these exercises and meditations, we experience who we are really are. We open up a field of consciousness within ourselves whereby it becomes easier, or at least possible, to confront the hidden agendas that we have allowed to cut off our divine connection. These exercises and meditations are powerful tools for breaking up the stuck energy in our bodies and psyches that have so tenaciously created and maintained separation and depression as a status quo. An initial goal is to stop and then reverse the descent into deeper states of immobility, self-abuse and pain. The meditations then create a safe inner space of acceptance, which allows us to look at how we disconnect and then be able to reverse the process. Over time we generate an ongoing experience of our own inner light and connection with our own soul. The following Kundalini Yoga meditation is on page 135 of my book Relax and Renew, which contains many meditations to relieve stress and depression. Yogi Bhajan taught it in 1979. This meditation totally recharges you and is an antidote to depression. It builds a new biochemical system, gives one capacity and caliber to deal with life, and establishes a direct relationship with the pranic body. 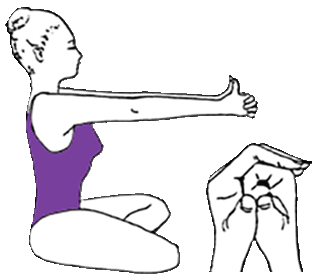 Sit in Easy Pose with a straight spine, extend the arms straight ahead, parallel to the ground. Close the right hand in a fist, wrapping fingers of the left hand around it, bases of palms touching, thumbs together and pulled up straight. Eyes are focused on the thumbs. Inhale for 5 seconds, and, without holding the breath in, exhale for 5 seconds, and then hold the breath out for 15 seconds. Continue the cycle, starting with 3-5 minutes and working up to 11. Progress slowly. You can also work up to holding the breath out for 1 full minute.